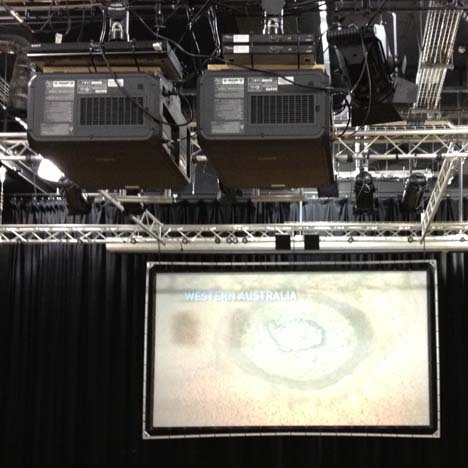 We have a Stereoscopic 3D projection setup for screening 3D Bluray or PC Digital Content in Full HD using Passive 3D glasses available for hire. Make your event stand out from the screen! We'll do everything possible to ensure your event runs smoothly! Categories: Hire, Projection, Stereoscopic 3D. 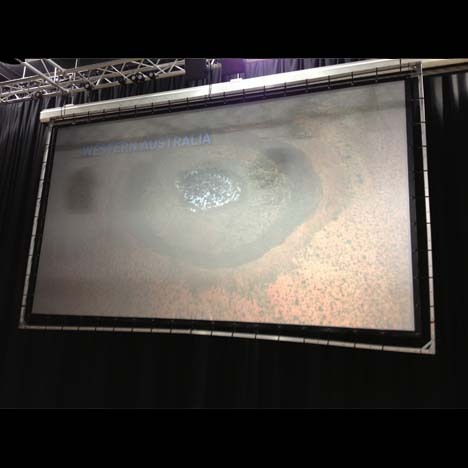 Are you looking to screen 3D content at your event? Do you have a speaker at your conference who wants to screen their stereoscopic material? Are you a film club looking to show a 3D movie as a special event? 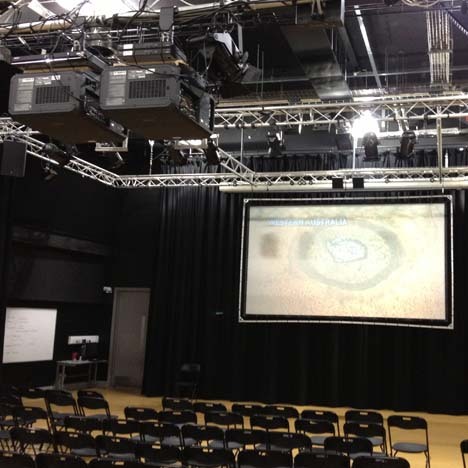 Pixelution can offer a full Stereoscopic 3D projection setup for 3D Bluray or Digital Files available to hire for your corporate event, film presentation, exhibition, conference etc. We have been involved in Stereoscopic 3D for many years and we have a long history of providing rental and permanent installations to many clients. Our systems have been installed in the Tower of London, Toyota’s flagship showroom in Paris, conferences (3D World, Dive Technologies), corporate events & launches (Johnson & Johnson, Bain), museums, schools, exhibitions (BET, BVE) and many, many Santa’s Grottos. 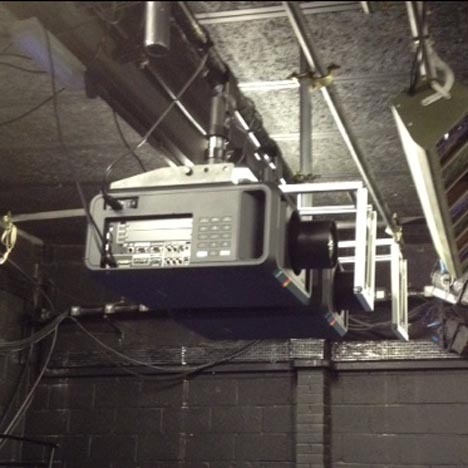 We use a Passive 3D system based on a dual projector setup with Linear polarising filters. This system uses Passive glasses like you would find in your local cinema – however our glasses use a different system to the RealD and other cinema glasses so you can’t use the cinema glasses for our screenings. The main advantage of Passive 3D glasses is the unit cost is low compared to the active 3D glasses you might use with a domestic 3D television. This is important for large audience numbers or trade-shows where 3D glasses can be lost, stolen or damaged. Using these glasses also gives us the options to offer custom made branded or un-branded, paper or plastic glasses – give your audience something to remember you by, great for exhibitions and trade-shows. Custom glasses take a few weeks to organise so please ensure you plan well in advance if this option is of interest to you. A common complaint by cinema audiences when watching 3D movies is that the image is too dark. 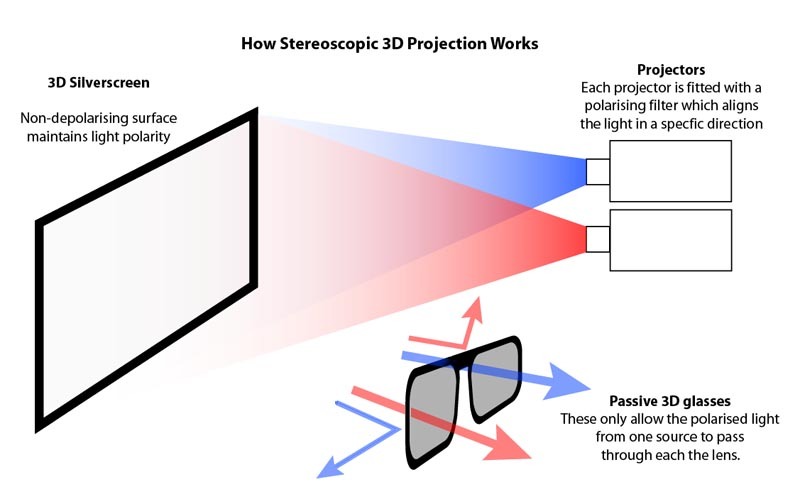 Projecting 3D reduces the brightness of the image a lot more than standard 2D projection. The image has to pass through the filters on the projectors, bounce off the screen and then pass through the 3D glasses before reaching the viewer. If you do not start the projection with enough light, by the time it reaches your audience the image can look very dull. We use a pair of 8,000 lumen Full HD projectors for our 4m screen which provides enough light to make images ‘pop’ from the screen when viewed in low ambient light. We also use good quality high-transmission glass polarising filters which allow more light, with less distortion, to pass through than cheaper plastic or low quality filters which can block more light and even warp under the heat of the light. If the filters warp then your 3D becomes an instant mess that will leave your audience un-happy at best or with a headache at worst. 2x Full HD Projectors – 8,000 lumens each – throw distance approx. 10m, other lens options available at additional cost. 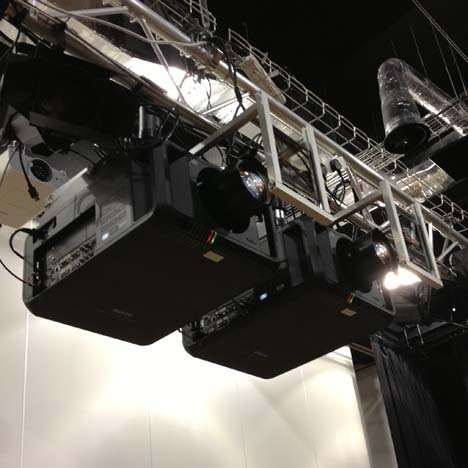 Projectors can be hung from a suitable beam or placed on our height adjustable platform. 1x 4.09m wide (viewable) 16:9 3D Silverscreen – height adjustable or can be suspended from a suitable beam. Trampoline style screen without a surround. 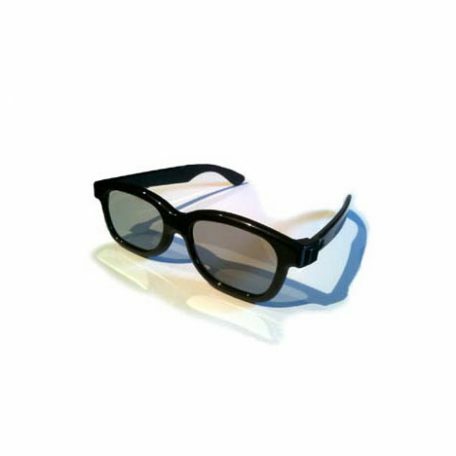 Polarising Filters and Passive 3D glasses – ideal for larger audiences where the cost of active 3D glasses is prohibitive. Package includes delivery, installation, attendance during the event, breakdown and removal. This package is charged starting at £2,500 +VAT per day for standard corporate and exhibition events. 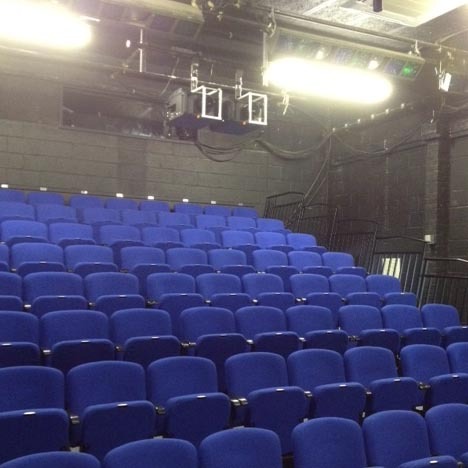 Discounts are available for educational establishments, local film clubs and extended rentals. Additional charges are applicable if your event is in a remote location, requires over night attendance etc. If you have a specific event in mind then please contact us to discuss how we can help bring 3D to your screening. You can use the form below. If you are generating your own content for screening we ask that you provide the material, or at least a small sample in the final format for testing in advance of the event. Our PC servers are capable of playing most compressed movie formats – H.264, Cineform etc. but due to the many different formats and codecs available we need to ensure smooth and reliable playback of your files before the event. We can accept nearly all 3D formats – side-by-side, left & right streams, checkerboard etc. Our preferred format is dual stream (left & right files). Audio can be embedded in the video files. If you require a 5.1 presentation then a separate audio file is the best option. Our basic PA system only supports Stereo audio but we work with a specialist audio company to provide full 5.1 theatre sound for larger events. There is an additional charge for this service. Price on Application. Use this form to request a quotation for your event. We have a range of high quality glass polarising filters available as Linear or Circular and rated for projectors up to 30,000 lumen’s. Details on application. Various screen solutions for passive 3d projection via a non-depolarising surface. 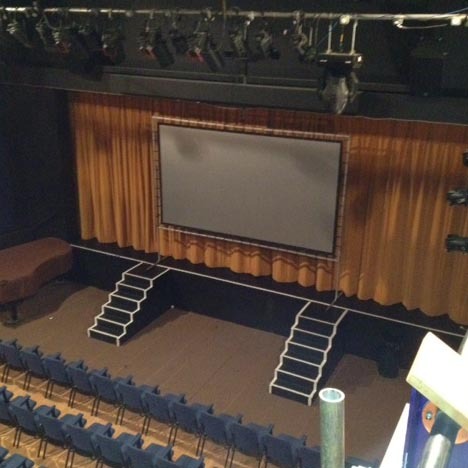 We can offer the SilverScreen material on its own or as a bordered screen solution with eyelets and bungee cords for fixing to a frame – we can also supply the frame if required. We also have a selection of rigid screen solutions based on the Goo Systems 3D paint – a cheaper alternative to material screens. We can offer filter mounts that attach to the lens barrel for the smaller filters and free standing or cradle mounts for the larger filters. Custom designs built to fit your projector and installation. Please contact us for details. A wide range of 3d glasses from paper to plastic, plain or with a full colour custom print job. Whatever your requirement give us a call and we will get you a quotation. We’ll be adding full details of these products to our website over the coming months but in the meantime please contact us with your enquiries for Stereoscopic 3D projection products.